Astronaut Mike Massimino talks about watching the urine freeze outside of the spacecraft. He said they would all watch, it was something beautiful to see. Are there any photographs of this, or has NASA prohibited taking such photographs? Massimino is talking about a waste water dump. Here is a video of one such dump. This video was taken on STS-125; Massimino was a crewmember on that flight. Lighting was critical to get an impressive view of a dump. The dump in this first video is viewed from payload bay camera A, and the light is coming from above, giving a great view of the droplets / ice particles streaming out. This video is taken from the end effector camera of the robot arm which has been maneuvered to view the dump. The light is directly on the port side of the shuttle and the view is far less impressive. 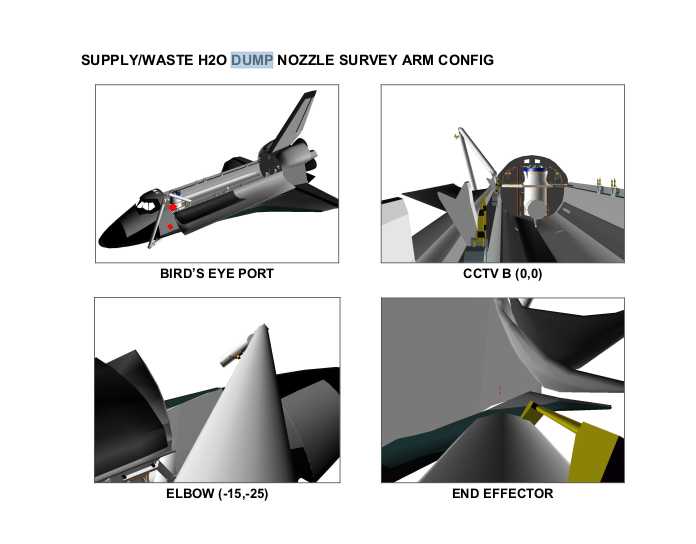 Here is a page from the PDRS checklist showing the arm position for viewing the dump. The upper red dot I added is the approximate location of Camera A. The lower red dot is the approximate location of the nozzle. There was no reason for NASA to prohibit taking pictures of this. Not the answer you're looking for? Browse other questions tagged crewed-spaceflight spacecraft space-shuttle waste or ask your own question. What are the synergies between today's suborbital private businesses and space flight?